The project was updating the wallcoverings in the Exhibitors Building first floor corridor and we were hired by the Amway Grand Plaza to complete the task. We removed the existing wallcovering and replaced it with the new look. We also updated all of the switch plate and outlet covers to complete the overall design. 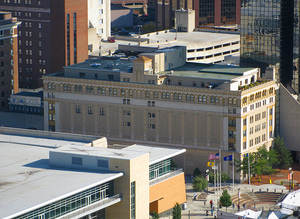 We were hired in 2002 by the Amway Grand Plaza to begin renovations on their bathrooms (excluding the tower). This has been an ongoing project for the past 6 years, completing over 400 bathroom updates. 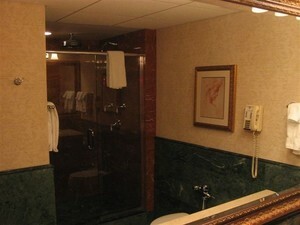 We completed the changes by adding new wallcoverings and paint to the bathrooms and some guest rooms.